In 1980 a foundation was set up for for children that were between the ages of 3-17 and suffering from life threatening illnesses. This non-profit later became known as Make-A-Wish-Foundation and now claim to grant a wish, on average, every 37 minutes. These wishes range from meeting a famous celebrity to heading to a favorite destination, often Disney World. While the Make-A-Wish Foundation was founded in the US, it started operating in the UK in 1986 and has since granted over 9,000 wishes to children throughout the UK. One of the most recent wishes granted was in Sydney, Australia to Domenic Pace, a 9-year old boy who has cystic fibrosis. 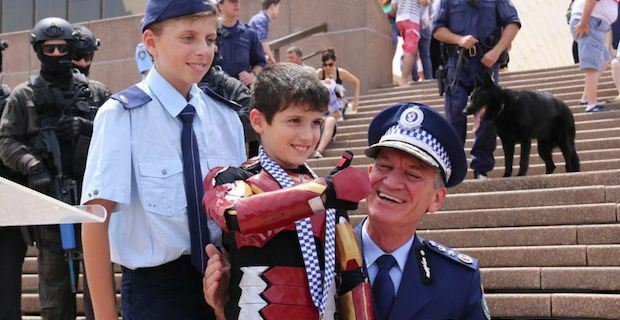 He made the wish of becoming Iron Boy for a day which came true with the cheering of many supporters. He was able to defeat his arch nemesis, Ultron outside of the Sydney Opera House and then rode in a helicopter and police speedboat to save the Make-A-Wish reporter, Hope Joy, from Ultron. Robert Downey Jr supported Domenic via Twitter saying, “sent a very special boy on a top secret mission today. Go get ‘em, Domenic”. A previous superhero wish was made in 2013 by California resident, Miles who is a cancer survivor. The 5-year old became Bat Kid for a day and set out to rescue the San Francisco Giants’ mascot and beat the Riddler in one of the largest and most elaborate Make-A-Wish projects ever staged. This included the involvement of 12,000 residents, the FBI and even the US Attorney’s office. At the end he even received a key to the city by mayor Ed Lee. In 2005 huge Top Gun fan, Evan Moriarty, got his wish as well. He spent a few days receiving a VIP tour of the naval flight center at the Seymour Johnson Air Force Base in North Carolina, was decked out in all the proper gear and at the end received an honorary certificate. The 5-year olds biggest wish though was to ride in a jet which he was able to do in a simulator. One of the most heart-warming stories though was when 17-year old Beatriz Tinoco who is a cancer survivor, was able to meet tennis star Roger Federer. In 2012 she not only met him but was able to attend his warm up sessions, received seats to the Wimbledon match and even hit a few balls with him on the court using one of his racquets. This will only make you appreciate this legendary athlete all the more.